I hate marigolds. I know, I know, hate is a strong word but I do. Actually it is not the marigolds fault that someone decided to take a once beautiful flower that sat plumply atop its long stem, into a laboratory, do things to it’s genetic make up and viola, make a short stubby flower out of it. What’s up with that? Who thought it would be a good idea? Don’t get me wrong, short and stubby is wonderful but not in a marigold. Have you ever seen a harlequin marigold? Now that is a marigold. That is why last autumn, when I made this piece with the marigold, it was a leap of faith. I was doing a lot of leaping last year, in fact I am still leaping but anyway that is another story. So, I was flipping through one of my many books of flowers looking for inspiration and was being drawn back to the page with the marigold on it. I wanted to deny the marigold. No, I said to myself, I can’t draw THAT on MY piece, I hate marigolds. Then it happened… I saw the layer upon layer of small petals in brilliant golden orange so precisely organized in concentric circles that made up this pouf like flower. The stems had fine hairs, furry and soft. The leaves jagged and dangerous looking. Such a complicated flower, its beauty up until that moment was, well, hidden to me. I did it, I drew the marigold. I looked closely at the the thing that I hated, in fact I did not just draw the marigold, I etched the marigold into the clay and lovingly applied the golden orange color to its petals. I know it is obvious but must I admit it? O.k. I will, I learned to love the marigold. These days I have the pleasure of traversing from office to studio by about ten steps. 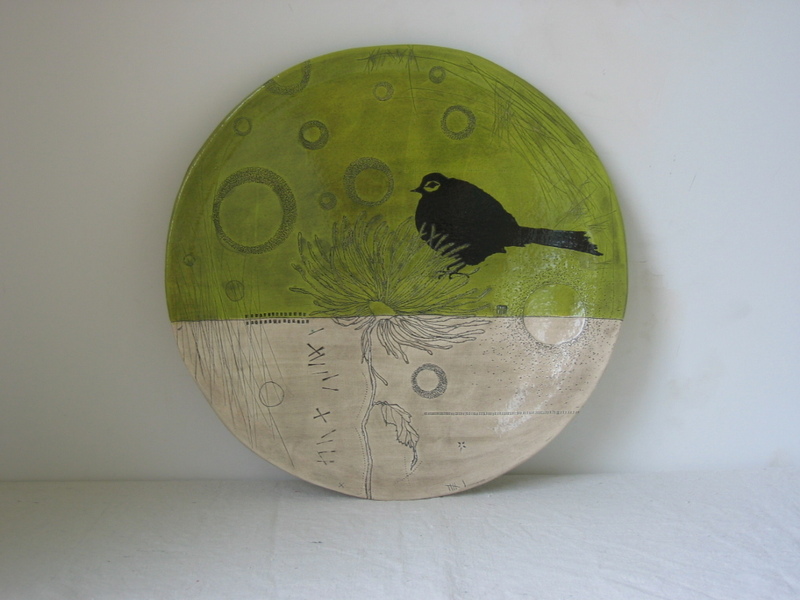 I usually bounce back and forth between the office/design work and my ceramic work. I did not make it into the studio at all today. 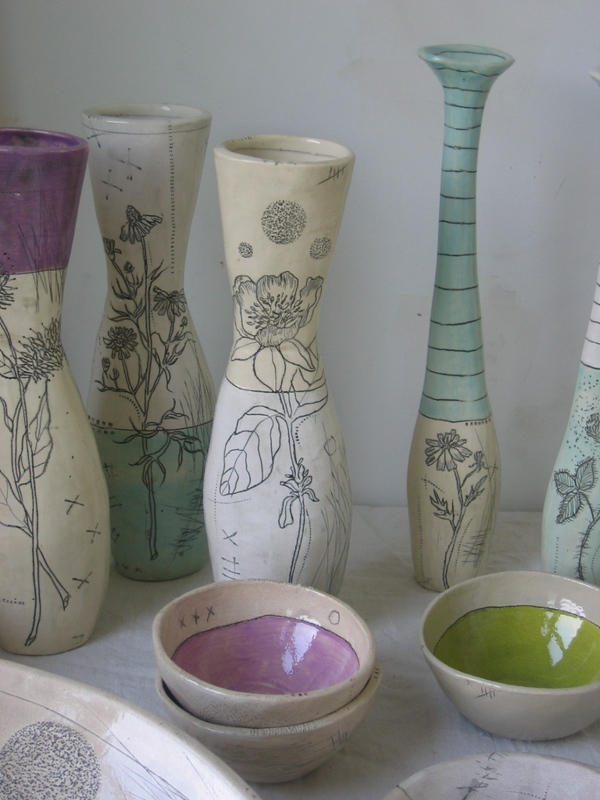 I have a table full of vases that I cast last week, wrapped in plastic, waiting for me to paint them. 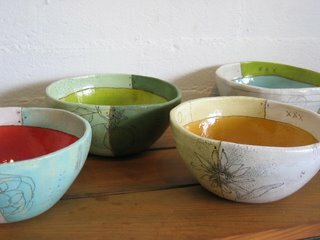 Then there are the bowls, all painted, waiting for me to etch away at them and the cups waiting to be glazed. Instead I went back at the “sprout” drawings and ended up with not a sprout but a dandelion. Actually I did get a sprout in there. A very sophisticated sprout not crooked and awkward like a sprout should be. I went for a run and was so sidetracked looking for sprout inspiration that I kept stopping and then would get distracted by, oh look at those pretty cows, their eyes are so beautiful, the cows actually trotted along side of me for a while, thought that was pretty cool and oh my there is a whole bunch of Japanese anemones growing back there, and look a humming bird, a chipmunk and turtle all in the road at the same time. Yikes! Then there is this blog. All the things I want to write about and all the great responses I have been getting. Needless to say I wasn’t very focused today but I sure did have a lot of fun looking for sprouts and hearing from all you folks. Thanks! I looked up at the clock and realized it was eight o'clock . I thought it was around two o'clock maybe three o'clock but not eight o'clock! This is what working on the computer does to me. It literally eats time. I have been working all day on a logo design for a Montessori school. I am having the hardest time trying to draw a simple sprout. No problem drawing a complicated honeysuckle or a rose, give me a multilayered peony no problem but try to draw a sprout and it's as if someone asked me to do three back flips in a row, no way can't do it, never could, never will. See it's that way for me, the simple stuff I have to make difficult in order to make it easy. Can anyone relate? 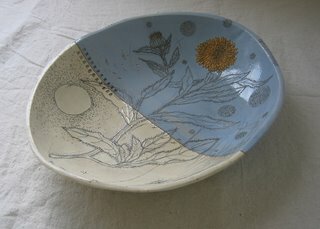 I am posting a picture of a platter I made last spring, Sarah my friend, who is starting the Montessori school, owns this piece. I had to post it to remind myself that I really can draw. I just can't draw sprouts. Oh and don't ask me draw anything on a chalkboard in front of a classroom full of school children, can't do that either. Preparing for this show has been relatively sane. I was good and did not try to do too much. The work was well paced and I did not do that thing I usually do which is think I need way more pieces than I actually do. With this said, it is still exhausting to put a show together. Good exhausting. I thoroughly enjoyed setting the show up with Meg and Marilyn at Classic Country. They were so accommodating and fun. They put up with me asking them to take just about everything out of the barn other than a few tables and chairs. It was one of those moments when the space, the people, the work all flowed and the set up happened naturally. It has been a week of birds...my birds and other people's birds. Check out Strange Fragments, lots of cool birds in her neck of the woods. I have a new bird platter that is fresh out of the kiln. 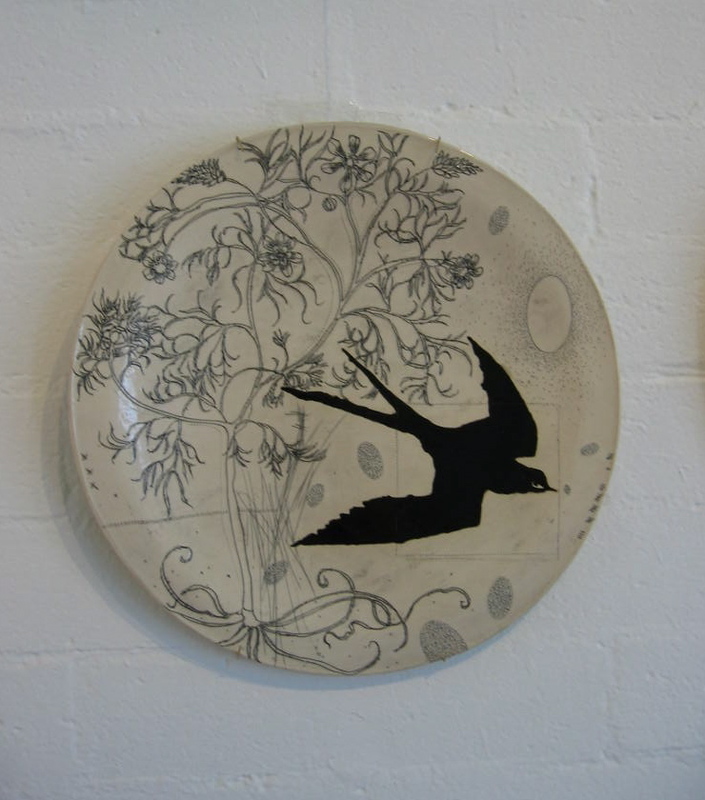 I am always happy when the platters come out of the kiln unscathed as I usually get one out of every three. After working on them for seven hours (not including firing times) it is heartbreaking when they don't turn out. I had good luck this time around and luckily this piece really is for the BIRDS. Twenty-four hours to go before I set up my show. I am in the studio glazing my final pieces. Here is a little peek of what will be in the show. 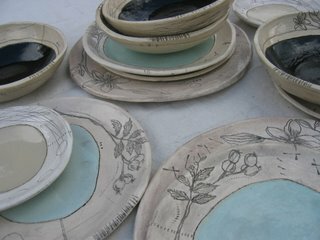 This is a new dinnerware line that I have been working on. I had to remake the dinner plates three times as the first ones turned out flat as a pancake. They were so flat my friend Bill said they looked like clay pigeons and suggested we take them outside, throw them in the air and shoot at them (all for fun of course!). I opted to go back into the studio and make them look like dinner plates. a lady who loves tools. I thought about my tool story for a few days, fathers day passed and then I found myself in the print studio with my friend M.C. getting an in depth tutorial on how to use her Vandercook letterpress. I am having a show this Saturday and I got this idea to print napkins to go with the new dinnerware set that I made. After working with her and hearing her story about the press I realized that I needed to write about her and her journey with the press. Ah ha, this is a great tool story! So sorry Dad, you'll have to wait. M.C. inherited the press from friend who moved it out to New York from California. The friend who moved it out here from California did not have a place to set it up and stored it in her garage. In the friend's effort to keep the press safe she wrapped the rollers in towels. The climate in the East, is well, moist. The towels got wet and the rollers rusted. The friend ended up donating the press to M.C and her husband for The Studio at Brickhouse Farm (more about this in the future). M.C. took it upon herself to put the press back together and to get the old beast back up and running. With only the knowledge of how to use the Vandercook press as an Artist for printing purposes she set out to repair the machine back to its original glory. She befriended a Vandercook expert who advised her on how to repair its broken parts and scoured the yellow pages and Internet to gather all the missing bits it needed. Eventually she removed all the rust, repaired the damaged parts and put it back together. All by herself! One lady. The most amazing part of the story is that not only did she put it back together and refurbished the parts on her own, she did it all using non toxic materials, vinegar and cooking oil. She cleaned the rust off of rollers with vineger and maintains the health and happiness of the rollers with the oil. 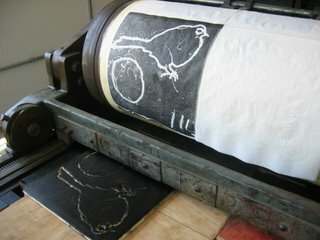 We also used the cooking oil to clean the ink off of the rollers. Who knew that the makings for salad dressing are also great for cleaning rust and ink? I think this is super cool. I think SHE is super cool. I have so much more to say about tools but am going to leave it for a future post. Here is a picture of the press in action printing the napkins for my show. to cup or not to cup ? Ahhh, cups... I love em' and I hate em'. Mostly I love them. I collect cups from other potters (only white ones). A good cup is such a pleasure to hold if it is made well. I like them light with a lip that feels good in the mouth. Handles, if they have them, should be nice to hold, enough room for two fingers, though I love cups without handles. Christa Assad makes a great cup. 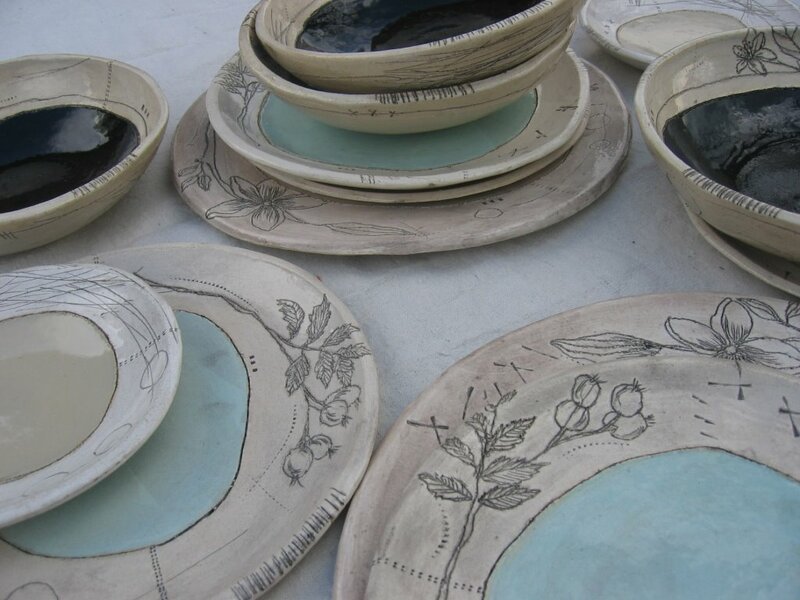 Her work is so lovely to hold and over time her glazes patina with use. 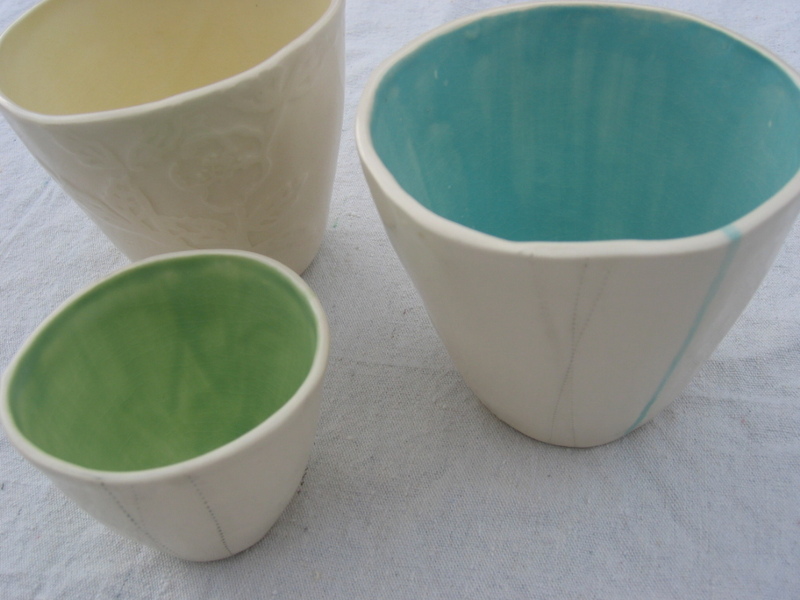 I have also been admiring Karin Eriksson's cups. They are unusual and graceful. I will have to add some of hers to my collection. I battle with the cup, mostly because of the time it takes to make them. I often say to people "I am not a cup maker" which is a big fat lie. I am a cup maker. I just made about twenty of them with my new self made molds. I am experimenting with new techniques for the surface. In the past I have drawn a little flower, stained it black and painted the inside of the cup. Now I am working with a relief pattern on the surface, combining hand painting and stitch marks. I keep trying to keep it simple but that is impossible for me. So here I am again battling with the cup. Screwy, I know. I should just give in and say, I AM A CUP MAKER! Everyone loves the cup. Especially me. I just finished this collection of pieces for a store in Kirkland, Washington called Liberty 123. It was nice to use all these soft colors. The lilac color is new for me. While I was working the lilac bushes outside my bedroom window were in bloom and the trees were leafing out in vibrant shades of green, chartreuse being the most dominant. I have never before seen trees change from winter to spring with so much fervor. Being from the West Coast, the seasons change but much more subtly. I have fine-tuned my senses to their onset in the West so you can imagine the sensory overload I am experiencing watching the seasons transition here on the East Coast. I want to lick the color it looks so delicious. A little about my collections and how I work with clients. I have a large palette of colors, shapes and themes from which I work. Often stores have a "look" they are projecting. Some stores even have colors that they never use, like blue for instance; I have one store that stays away from blue, no kidding. With this in mind I like to work with people on a one on one basis, talking about the colors, themes and shapes they like and then once I glean this information I ask them to let me go and I put a collection together for them. It is good way to work for me. It is sometimes a little confusing on the ordering end of things as there are so many options. I am constantly amazed at how willing people are to be open to my zany method. In fact I find people like it. They like the fact that they are getting something original that won't be seen in every other store. I sometimes think I should only offer specific colors, shapes and motifs. It would make things easier and perhaps more predictable but predictable can be boring and I like that I can approach each order as a body of work. This way I am not confined to making the same thing over and over again. Monotony kills the spirit, at least for me. Plus I know that the store has something special to offer their customers. A one of kind.